If you haven’t done it already, pop the popcorn, and set aside. 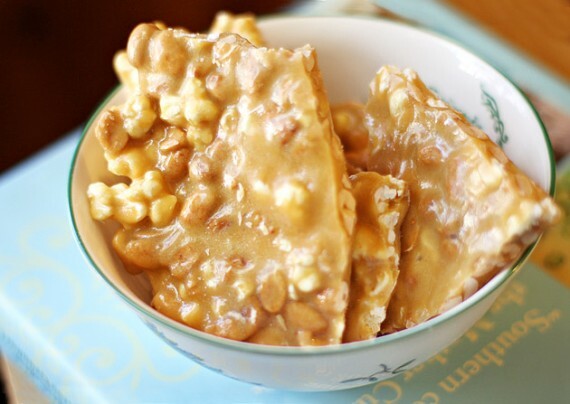 To Make the Brittle in the Microwave: Combine the sugar, light corn syrup, and salt in a large glass bowl. Microwave on HIGH 5 minutes, add peanuts, and microwave 2 more minutes with 1,000-watt microwave. (Microwave 4 more minutes if using a 700-watt microwave.) The mixture should be golden brown. Cool until firm, and break into pieces. Store in an airtight container. To Make Brittle on the Stovetop: Combine the sugar, corn syrup, and salt in a medium-size heavy saucepan over medium heat, stirring constantly, until mixture starts to boil. Boil without stirring 5 minutes or until a candy thermometer reaches 310°. Add peanuts, and cook 2 to 3 more minutes or to 280°. (Mixture should be golden brown.) Remove from heat, and stir in butter and remaining ingredients. Pour mixture onto a metal surface or into a shallow pan. Allow to stand 5 minutes or until hardened. Break into pieces. Store in an airtight container.